Now that the busy holiday season is behind us, its time to recap our experience at Make-It Vancouver. As our first major Craft Fair, I’m pleased to say it was an overwhelming success. By the end of the 4 days we were sold out of many of our products and were busy stitching and printing more in between customers to keep up with the demand. 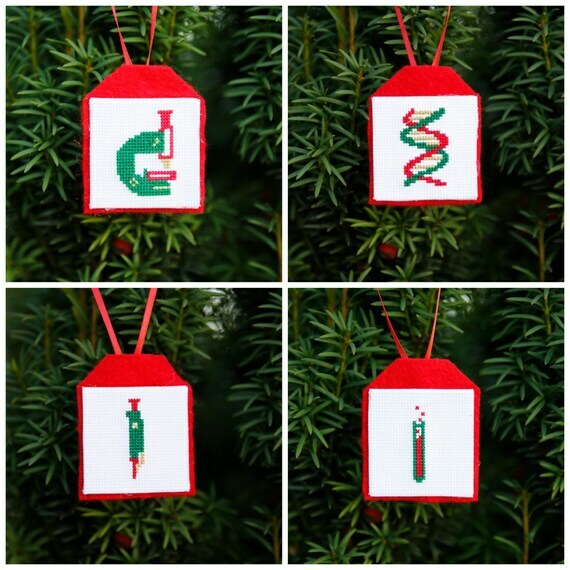 Our “It’s a Small World” Set, especially the DNA ornament, was a big hit. It was great to not only get to chat with customers about our products but also talk about what inspired our designs and the science behind our projects. Many people there had never gotten the chance to see a 3D-printer up close, so kids and adults were equally hypnotized by it busily printing our virus ornaments and DNA icicles. I’ve always thought that one of the greatest appeals about craft fairs is being able to meet the people you were buying things from and being able to hear the stories behind the things they make rather than just picking them up off a shelf. As a vendor at a craft fair its also really cool to meet the people buying your products; from people who heard about us online to science teachers looking for gifts for their class it certainly was a diverse crowd. One of my favorites was a mom who noticed her child really wanting one of our animal scientists and secretly came back later and bought it to surprise them for Christmas. The CraftGeeks had a great time at our first Craft Fair and we can’t wait for the next one. See you at Maker Faire in June!